I love breakfast just as much as the next guy. But sometimes, I have trouble figuring out what to eat. See, I’m totally a morning person and can be up and running and ready to go within a good five to ten minutes upon waking. It’s staying up late that I cannot handle. I am programmed to be a grandma and fall asleep at seven. Things just happen that way, people. On Sunday mornings, my mom usually makes breakfast for everyone. I’m not sure why since my mom hates cooking, but she does and it’s nice to walk out to the smell of sizzling bacon, bacon-fat-fried hash browns and buttery scrambled eggs. Not surprisingly, I don’t turn it down! But all the other six days of the week, I’m stuck. I usually go through monthly ruts where I’ll fall positively disgusted with a breakfast consisting of a dry pizza bagel EVERY.MORNING that I’ll start turning all murdery because I want something new and exciting. Soon, the “new and exciting” ham and cheese scramble will grow old and I’ll look to whole grain Eggos with peanut butter and syrup. I was doing the PB & syrup waffles for awhile until I realized my jeans were becoming a tad too tight and I was getting a little bit too spread-happy with that peanut butter. It’s a shame something so good has so many calories, but I already knew the world was cruel when people gave Snooki $10,000 an episode for that god-awful show, and when I started reading Mockingjay and immediately wanted to fall asleep. Some things are just so damn saddening. 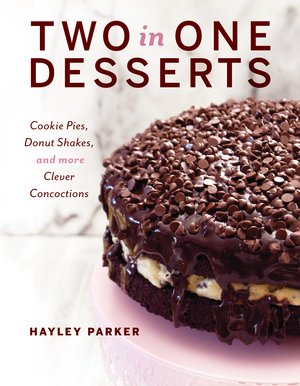 I used to have this friend who had like, a Better Homes and Gardens style kitchen with a cake stand complete with actual slices of homemade chocolate cake inside of it. If we’re being honest, my cake stands house dust and disuse, so there are virtually no traces of anything edible or attractive in or on them. And one morning I went to her house and she had like, a bazillion options in her ginormous kitchen of breakfast foods. Spinach and sundried tomatoes to accompany an egg-white omelet; thick, Texas toast for French toast; fresh fruit to make those opulent fruit bowls you get on vacation; and scones. Call me crazy (it wouldn’t be the first or the millionth time) but I’ve never had a scone. Ever! I looked at that semi-triangular mound of … scone-like ingredients… and wondered how many other houses regularly stash scones at the ready for breakfast? I mean, if we’re lucky we have a spare, slightly stale English muffin somewhere at the back of our pantry. Definitely no scones in sight, I’ll tell you that. So I snuck myself one of the lemon poppyseed scones because you only live once and I’ve only ever stolen a McDonald’s Play Place ball from the ballpit and my mom made me return it, so I figured I better escalate my game and forge a new habit, so I figured stealing scones would be easy and virtually painless (and very delicious), so I took one. It was dense yet light, with tons of layers of lemon zest and crunchy poppyseeds. In other words, it was really good–but I have yet to make one or get one since then. Perhaps it was the thrill of getting caught scone-handed that frightened me from eating them for awhile. But it’s since been over a year since that fateful day, and I had scones on the mind. 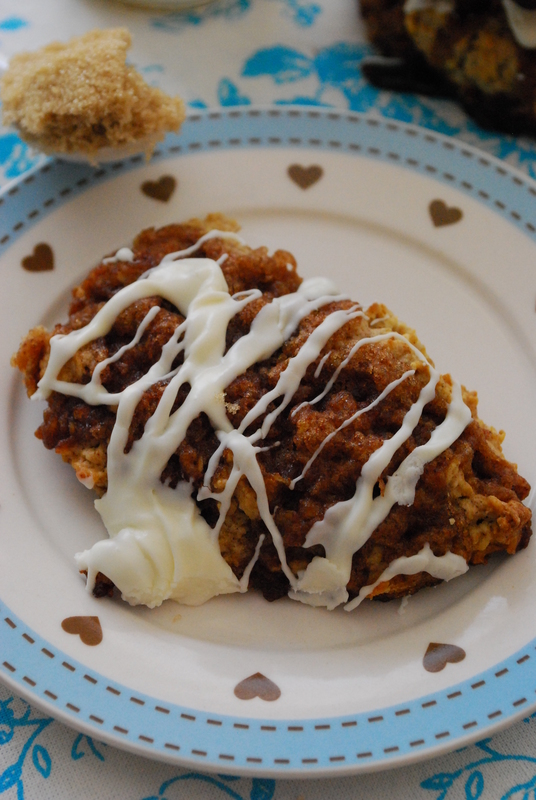 While flipping through my awesome Hungry Girl 300 Under 300 cookbook, I found a recipe for “Coffee Cake Scones” that boast less than 300 calories apiece. But since I didn’t have all the ingredients on hand but I did have this unshakable scone-making itch, I decided to make them anyway and improvise as best I could. The result? 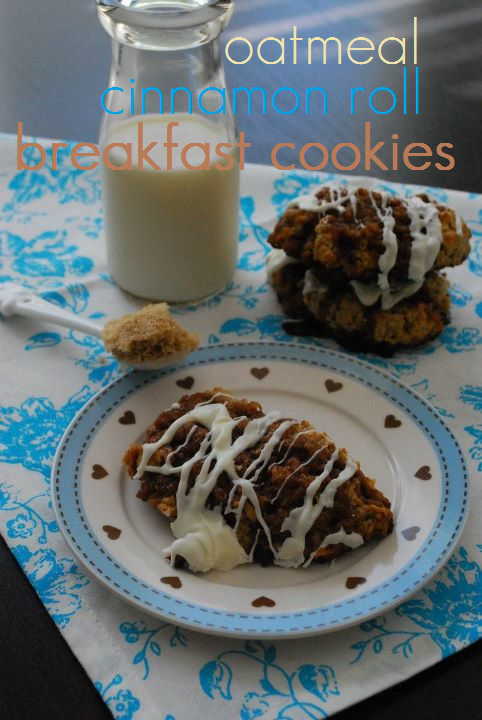 Not so much scone-like, but more like a big, fat, pillowy breakfast cookie. Chewy, soft, and sweet, they made me forget entirely about–what were we talking about? And the recipe only yields four, I made a double batch and proceeded to eat them all, save for one I gave to my brother. I figured since they’re healthy, they’d be good for me. And I could never turn down a cookie for breakfast. Obviously! 1. Preheat oven to 400 degrees. Line a baking sheet with foil and mist lightly with cooking spray. Set aside. 2. In a large bowl, combine the oats, baking mix, milk, two tablespoons of brown sugar, 2 tablespoons of butter, 2 teaspoons of cinnamon, about a half teaspoon of nutmeg, and the baking powder. Stir all the ingredients in the bowl until completely mixed. 3. Drop heaping mounds of dough onto the baking sheet, evenly spacing them apart. You should get about four medium-sized mounds with a single batch. Bake for approx. 8 minutes. 4. Meanwhile, in another small bowl, mix together the remaining brown sugar, butter, cinnamon and nutmeg until a soft paste-like consistency forms. Scoop the brown sugar mixture on top of the par-baked cookie mounds, spreading it as evenly as possible. 5. Return the now covered cookie mounds to the oven for an additional 4 minutes or until golden and firm. Allow to cool slightly before drizzling with icing. Best served warm. The brown sugary glaze gets super caramelized and almost crunchy when it’s baked on top of the soft and chewy oatmeal cookie. 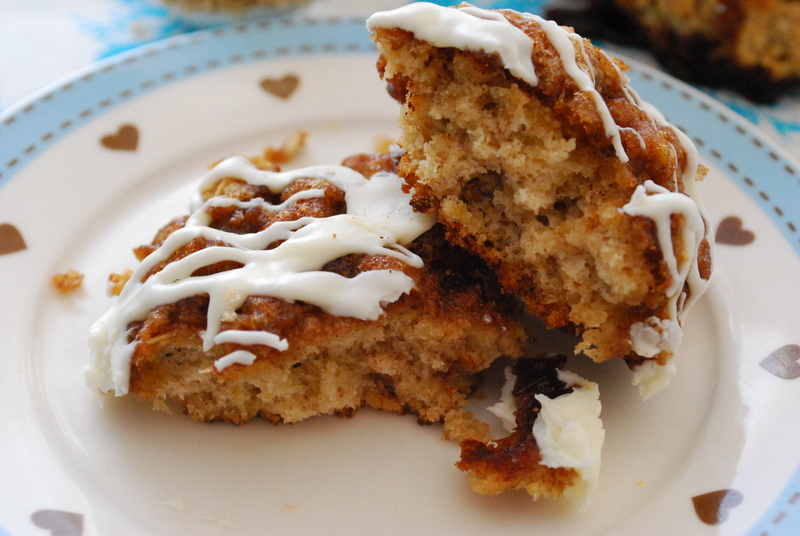 Complete with the icing, it is totally reminiscent of a cinnamon roll, but in a plush cookie form. Brilliant. I hope you enjoy these–have a great Saturday and weekend! Ha! 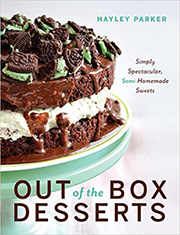 I have this cookbook and I actually got it out the other day because, since coming home from vacation, I realized my pants are getting a little snug around the midsection. But you’re right, since they are healthy, I think it’s totally fine to eat the entire batch (or double-batch even). 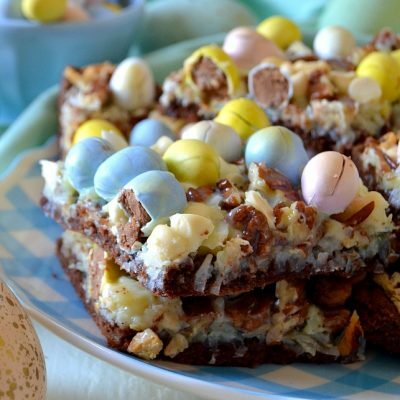 They look awesome….and, since I happen to have the ingredients in my kitchen right now, I might go make a batch for breakfast right now. OMG, yum. Oooh, I’m glad you have this one, Ashley because it’s SO awesome–I LOVE Hungry Girl! I make her guilt-free cinnamon rolls and fries and chicken strips and stuff ALL the time. Her faux frappuchinos are one of my faves, too 🙂 have a great weekend, doll! I love a good cookie for breakfast. I mean, who wouldn’t? I’ll need to make this. It looks amazing, plus I can be awarded mother-of-the-year by Jordan because I let her have a cookie for breakfast, no yelling, begging, pleading, or tears required. I am ALLLLL over those cinnamon bun donuts!! Let’s make each other breakfast?! Breakfast cookies round out breakfast cake and breakfast pie in this house. 🙂 Nice to see someone actually saying it OUT LOUD! And, when you are moving back into the English muffin or bagel genre, I highly recommend the Jif chocolate peanut butter spread. I know….I’m sure it’ll make it’s way to breakfast cookie fame very, very soon! Hi Holly! Sadly, I have no idea. But since I did stick pretty closely to the Hungry Girl version, I’d say they have around 300 calories or less.